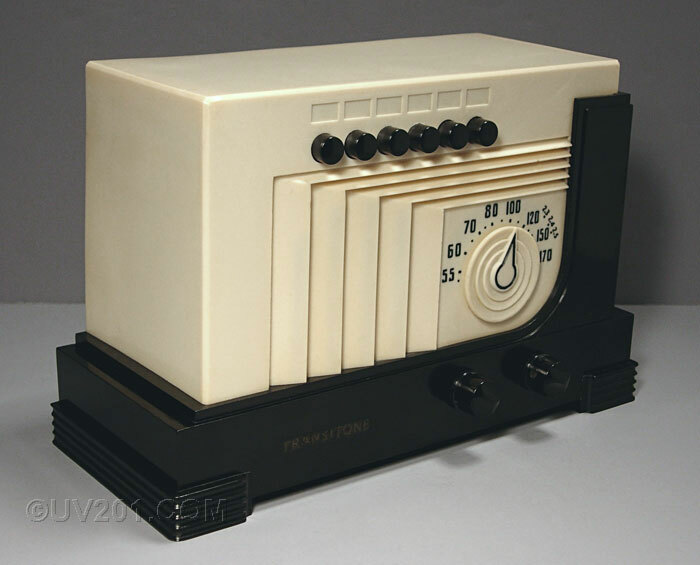 This is a very unusual Philco model which featured a two piece cabinet of white Plaskon and black Bakelite. 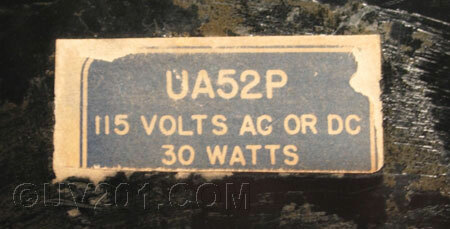 The model UA52P appeared in 1939 or 1940 at a list price of $19.95. To begin to understand the place this radio occupies in Philco history, one has to look first at the Simplex Radio Company of Sandusky, Ohio. 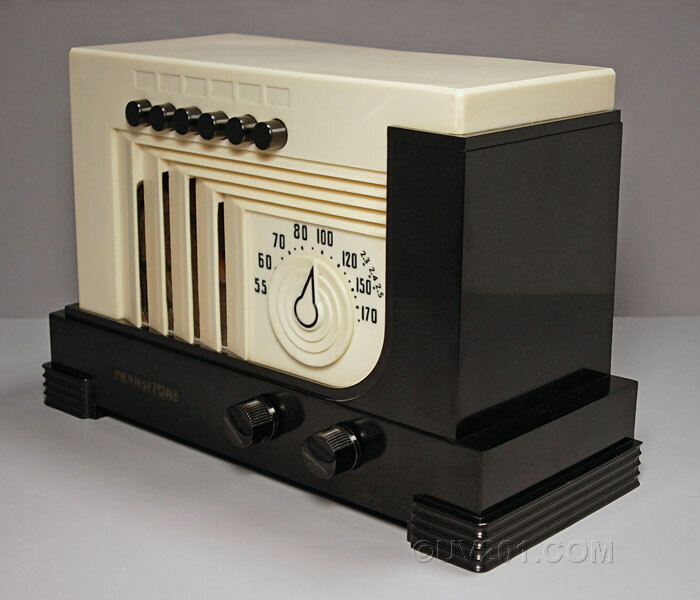 Simplex was founded in 1924, and built a number of interesting Art Deco radios in the early to mid-1930's. Philco was looking to expand its manufacturing capacity, and through stock purchase, it gained control of Simplex in 1937. 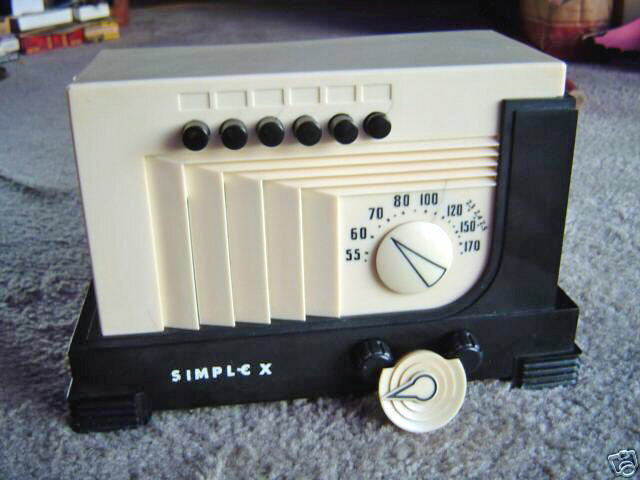 In 1944, Simplex ceased to exist as a separate entity, and was fully absorbed by Philco. It appears that a number of the small table-model Philco radios of the late 1930's and early 1940's were built by Simplex, and many of them were probably Simplex designs, including the one shown here. This particular radio model is unique in the sense that it was sold both as a Simplex and a Philco. It is a particularly rare model, and is one of the most sought after Philco products. This set was made in colors other than black and white. I have seen a picture of a Simplex version with a blue base and a white upper section (the knobs and pushbuttons are also blue). It is quite likely that only the black and white version (the least rare of these) was sold as a Philco. The "official" model number, UA52P, is completely foreign to Philco's system, so it is clear that this was a Simplex number. 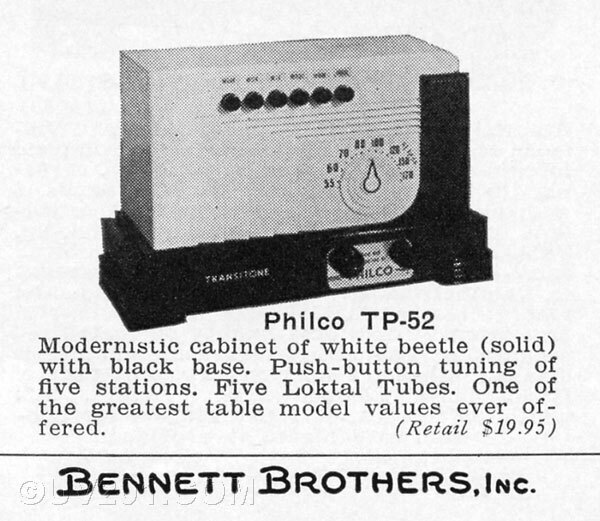 The advertisement shown below shows this as a model TP-52, a typical Philco number, but it doesn't appear that this number was actually used. No service information appears to have ever been published under either model number for either company. 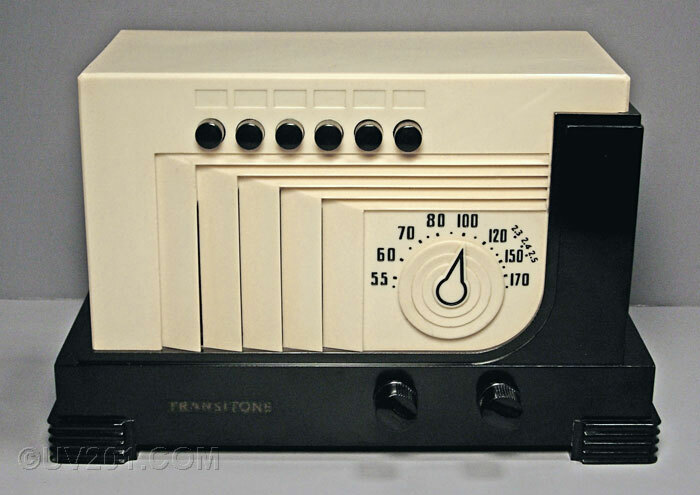 The "Transitone" name was one that Philco acquired with the purchase of the Automobile Radio Corporation in 1931. About the time of their takeover of Simplex, they started using it for small home radios as well. An extensive search has not revealed a design patent covering this radio. The question remains unanswered: Why is this model so rare? Philco obviously didn't go to great pains to promote it. Perhaps they thought the design was too radical, or perhaps there were manufacturing problems. This example of the UA52P marked with the Simplex name was sold on eBay in October, 2006. These pictures appear here with the seller's permission. This set has the correct knobs which are of a design that was used on many small Philco radios. The tuning dial on this set is from another model. The incomplete one below is the correct part. It was made of Plaskon, and is thin and very fragile. Interestingly, I have seen this dial in black Bakelite with a white painted finish. This entry appeared in the 1940 edition of the Bennett Brothers catalog. Bennett was a wholesale distributor of merchandise that included jewelry, watches, furniture, clocks, flatware, gift items, sporting goods, appliances, toys, and radios. So far, this is the only contemporary source in which I have seen this radio illustrated. The picture shows a radio with the Transitone decal and a label of some kind of label between the two control shafts which identified it as a Philco. The tube location chart that was glued to the inside of both of these radios recommended the use of Philco tubes. I have never seen an original back for one of these sets. It would certainly be interesting to see how they were marked. 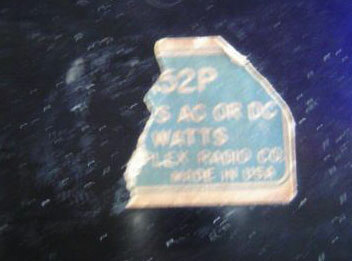 Shown above are the stickers on the bottoms of the Philco and the Simplex versions of the UA52P. The stickers are the same, but they apparently cut off the bottom section of the sticker on those sets that were to be sold as Philcos to remove the Simplex name. Interestingly, this was done after the sticker was glued to the bottom of the cabinet (you can see a cut mark in the Bakelite). 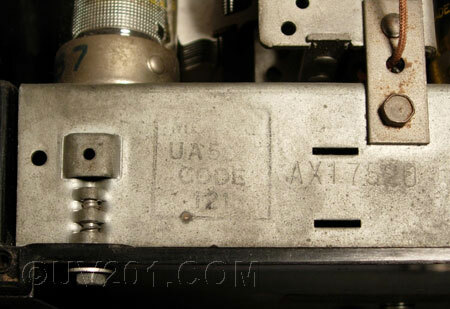 Below is a view of the rear of the chassis showing an ink stamp identifying the model as the UA52P. Philco used a "code number" designation to identify factory runs (often with minor design changes to distinguish the individual codes). It seems that, in most cases, "Code 121" was the initial design version. I doubt there were any additional codes assigned to this radio. It's strange that they didn't use the Philco TP-52 number.